Beautiful Lakefront Home in Highlands. Paradise! This beautiful lake home gives you two large decks to enjoy paradise! You also enjoy a lovely view from the balcony off the second-story huge master suite and dressing area!! Gorgeous lake and mountain view from our first story master bedroom. Charming spacious, family kitchen, with access to large deck, affords eating area, lake views and is fully-equipped for family and/or entertaining. First story and second story master suites recently renovated. The Great Room gives access to another large deck over looking the lake. It has a beautiful stone, wood burning fireplace and 52" Hi Def TV for your enjoyment. Beautiful dining room with large dining table provides your family and guests optimum enjoyment. 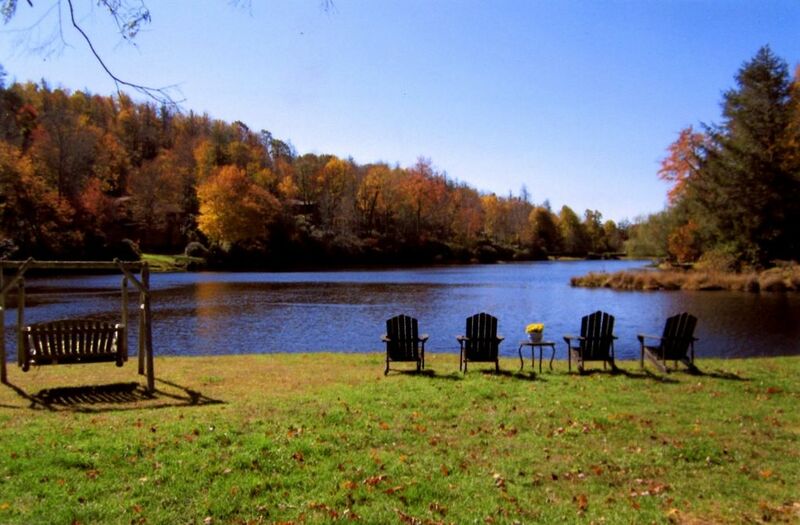 Enjoy playing croquet and badminton on this half acre of pristine lake front property. Top of the line Club Tennis courts available. Take full advantage of a pontoon boat, a trolling motor boat, and 3 kayaks. We also have pickle ball and corn hole game and also a beautiful spacious fire pit area with a picnic table and a hammock. This was constructed by family who recognizes the need for a fire pit as being optimal for story telling, roasting hot dogs and making smores. (3) Upstairs Master Suite has Plasma, surround sound, 52' flat screen T.V. and Great Room - 52 inch flat screen plasma T.V. DVD player and surround sound. Downstairs master suite - 42 inch High def T.V. This property lived up to and exceeded our expectations for our family weekend get-away to the mountains. We had six adults and two small children, and the layout was excellent for all of us to be comfortable and still enjoy some privacy when needed. The setting on the lake is spectacular! From inside the home, you feel as if you are on the deck of a boat with a beautiful view of water all around! We used the pontoon and our nine year old grandson will always remember catching his first fish on this lake! Bob, our host, was extraordinarily helpful and accommodating, and I feel as though I made a new friend through our correspondence and phone conversations. We highly recommend this property! A beautiful place, perfect for our weekend getaway! The setting of the home is gorgeous. The house was immaculate and the owner was a pleasure to work with, following up promptly and providing above and beyond info on things to do in town and where to catch the best fish. Look forward to going back! Had an incredible weekend in a beautiful home, great for outdoor lovers and indoor alike. The kitchen overlooks a stunning lake. Home is fully equipped with everything you need for a great weekend. We loved the outdoor fire pit and indoor fireplace. We spent the afternoon sitting by the lake and playing yard games and spent the evenings cooking yummy meals. Spacious, comfortable sleeping environment. 5 min drive from downtown highlands. Hope to return! Bob is a gracious and communicative host. We loved the house and what a beautiful location. Water views out every window and just stunning. Bob was great to work with and we would HIGHLY RECOMMEND this house for anyone wanting to get away & love it. This home sits on the most beautiful lot on the lake. We spent an amazing Christmas there. We went Christmas tree hunting, ice skating and had amazing dinners in the Highlands. Plenty of space for the whole family. Great location, amenities, home owner very attentive and helpful! This rental was absolutely the perfect fit for my family of 9 over the Thanksgiving holiday. The location is phenomenal for those outdoor fans, you can kayak, use the firepit or go for a hike on any of the nearby Nantahala trails within just a short drive. Highlands itself is a beautiful little town and Black Friday shopping was great! Bob made sure we knew everything about the rental and the surrounding area before we arrived and called to check in with us during our stay. My only complaint is that I wish we could stay longer!! We are definitely planning to come back!! 3 Kayaks - 2 adults - 1 children's. A large outdoor 'fun filled' play area nestled in a wooded area on our property with a huge stone firepit great for roasting hot dogs and marsh mellos, a hammock and a picnic table. Access to 2 beautiful tennis courts within walking distance in the development. Croquet, Badminton, horse shoes, 1 - two seater trolling motor boat included price of rental, no fishing license required, lots of rainbow mountain trout and bass. Cleaning fee $175. Rates are subject to change until reservation is confirmed.